Students at Spring Woods High School are dancing, singing and acting their way out of the woods and into Cajun country in their upcoming performance of Into the Woods. The bewitchingly popular musical, with music and lyrics by Stephen Sondheim, was made into a Hollywood movie by Disney in 2014, and even performed by students at Spring Woods over a decade ago. When directors Terry Hibbert-Ismert and Chrissie Cutler decided to mount the show again, they thought it was time for an update, setting the show in a Cajun swamp instead of the fairy-tale world. 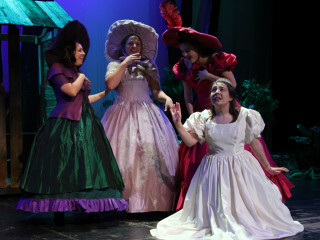 One addition to the show’s Cajun adaptation is an ensemble role, in which five students will play a mystical Swamp Creature.